Daniela Filiberti received her Bachelor Arts Degree in Education at St. John’s University in January, 1990. She began her teaching career at Sacred Heart School in Bayside where she taught for three years. 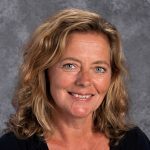 Upon completion of her Master’s Degree in Reading at Queens College, in June of 1993, Mrs. Filiberti received her permanent New York Certification in both Elementary Education and as a Reading Specialist. She went on to work for the Department of Education at P. S. 108 in the Bronx. She taught first grade for seven years at P. S. 108. When her children were of school age, Mrs. Filiberti was given the opportunity to work at St. Anastasia School, and then at Divine Wisdom Catholic Academy since 2006. She has been teaching the Art program to all of the students in grades K through grade 8. She is excited to learn new things and enjoys incorporating read-alouds with the students and integrating lessons with regular classroom curriculum.